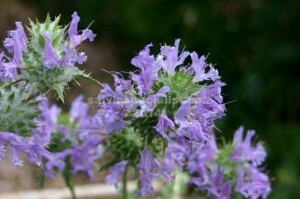 This small salvia is a Californian annual, known as thistle sage for good reason. It is a prickly plant with attractive grey foliage and round heads of lots of mauve flowers which come out a few at a time. Salvia carduacea is grown from seed sown in autumn to mature in spring and is cold and drought tolerant. Grows best in full sun. It is one of the chia group whose seeds are very good protein. I don’t usually offer this plant for sale.